Former in-house designer for Anchor Amy Adams is the face (and fingers!) 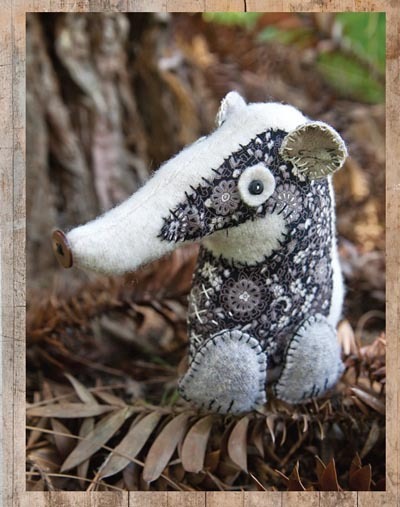 behind LucyKate Crafts, a blog dedicated to the wonderful world of sewing, textiles and the animal kingdom, with its own quirky little twist of course. Read on to discover what inspires her, where she hunts for fabric and exactly how she feels about sharing her name with a certain Hollywood starlet. Black Cat Originals (BCO): So when did crafting first come into your life? Amy Adams (AA): That most definitely stems from my mum. 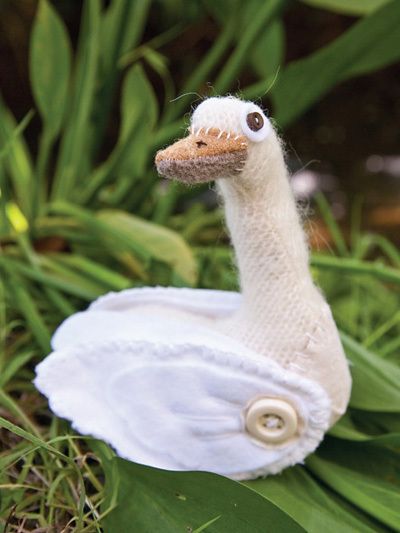 She was a knitter and sewer as a child and knitted tiny dolls’ clothes that she used to play with. When I was little I remember playing with them too and also the button collection, which used to live in an old 70s stork margerine tub in her sewing box. I now have the dolls’ clothes and the sewing box, but not the stork margerine tub. I don’t know what happened to that! BCO: Do you remember the first thing you ever made? Have you kept it for posterity? AA: I have! It was a pincushion with a felt Snoopy motif glued on the front. I’d forgotten all about it until recently, when my mum moved house and we came across it in the loft. BCO: What’s the best thing you’ve made so far? AA: The best, (in addition to my children of course!) is the softie shoes. The pattern for those was a real labour of love. BCO: What about the worst? AA: And the worst? Well, after working as a designer of cross-stitch kits for Anchor for 12 years, there are a few cross-stitch designs I will never ever admit are mine! BCO: So why do textiles do it for you? AA: It’s always been textiles for me, fabrics, thread, buttons. I also love the recycling element. I don’t often buy brand new fabric, I hunt for clothing and bedding instead. The idea of giving something unwanted a new lease of life really appeals to me. BCO: What about other crafts? Do you do any? AA: Not really. Although, after leaving cross stitch behind completely when I left Coats Crafts UK in 2006, I revisited it last year and it wasn’t too scary. I might cross stitch again! BCO: What have you got on your to-do list right now? AA: There’s a project for a collaborative book using a particular brand of materials and I’m also working on some PDF patterns of my own designs, which are taking time to complete as I’m learning how to use various new software along the way. BCO: Where do you take your inspiration from? AA: Fabrics. I find quite often I’ll be doing the rounds of the local charity shops on the lookout for clothing I can upcycle, a skirt or a jumper will start the ideas ball-rolling as to what I can make with it. I had been running short of rust-coloured wool that I use to make the foxes with, until I spotted a linen shirt in just the right shade. It cost me £2 and I was really keen to get home and start cutting it up! BCO: Your projects are quite cute and quirky. Why do you think there is this interest among the crafting community for weird-but-wonderful projects like felt pancakes and cactuses? AA: In my opinion, this is being fed by Japanese craft books and magazines. The projects these publications feature have been truly inspirational to many crafters worldwide, particularly within the discipline of sewing. In UK sewing magazines, there has been a gap in the market for years for something less traditional. Selvedge broke the mould, albeit being features-based, and has led the way for the project-based craft magazines to follow suit. 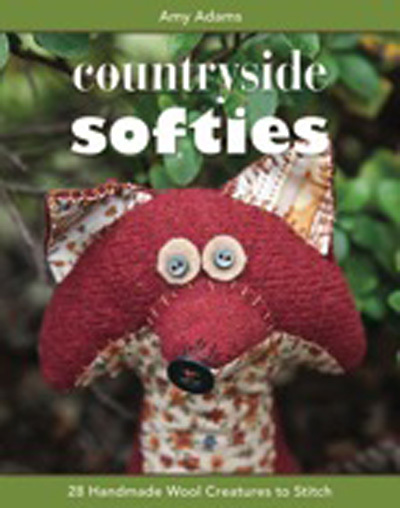 BCO: Tell me about your book, Countryside Softies. AA: It was the first idea I pitched when I was invited to submit a book proposal to C&T Publishing. I assumed it would need a fair bit of tweaking but they loved it. It was a lengthy process completing all the designing, making and writing, but once you get your head round the technical side of laying out all the text and images, everything flowed pretty smoothly. There was the odd hiccup – the box of all of the Softies went missing on the way to America. It completely disappeared from the online tracking system for about three days, only to turn up in New York. It was supposed to be in California, but I was so relieved it was found. Some of my favourite-ever Softie designs are in the book, the Otter and the Swan in particular are patterns I’m really fond of. Many of the jumpers I felted to make the animals belonged to my husband’s stepfather. They were passed on to me by my mother-in-law after he died, so I dedicated the book to him with the inscription ‘Look what I did with your woolly jumpers!’. BCO: What would you say has been the highest point of your career so far? AA: Without a doubt, the book. Being published was something I never thought would happen as when I worked for Coats, your name doesn’t get put onto the designs. Everything goes under the brand name of Anchor, so to have a whole craft book with my name on the cover is definitely a career high. BCO: So when did you decide to become a blogger? AA: I started blogging in 2007. I’d had a project accepted in a craft book called Making Stuff for Kids and needed a web address quick. A blog was the easiest option. BCO: How do you find the time to craft AND blog? Do you do it full time? 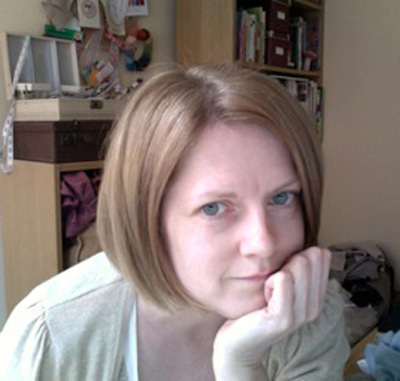 AA: At the moment I do, in between looking after the kids when they’re not at school. I am lucky that after many years of working full time, it makes sense for me to work from home as my husband is away a lot. If I don’t get done what I need to during the day, I can catch up in the evenings. BCO: Which of your tutorials are your most popular? AA: The eyepatch. My daughter has poor eyesight and wears strong lenses. On top of that she also has astigmatism and a squint. To exercise her weaker eye, we did patching for nine months, two hours a day. The optician gave us a box of the stick-on patches, but Lucy didn’t like them and they kept peeling off. So, after doing a bit of research and playing around with felt, I came up with a simple design for a felt eyepatch. I did this at around the same time I started blogging, so it was obvious I should post it as a tutorial. I get so many emails from people who have used the pattern and had great success with patching because of it. BCO: Why the name LucyKate Crafts? BCO: What have you found makes a successful blog? AA: Updating regularly, interesting content, nice photography, simple layout. Although, I must add, blogging isn’t what it used to be. What you find now is that most people don’t visit the blog directly, it’s all done via a feed reader. The blogging community is huge, it has grown so much since I started out. BCO: Got any tips to help anyone about to start a craft blog? AA: Just jump right in. Personalise your blog, give a bit of thought to branding when sorting out the layout, colours and header banner. 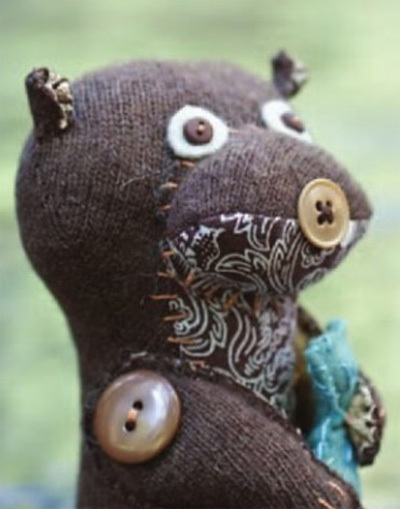 Leave lots of comments on other blogs and become involved in the online craft community. BCO: Are you a Pinterest fanatic? AA: I am on Pinterest and I really enjoy using the site. I didn’t worry too much about the recent copyright debacle and held out, hoping they would change their terms and conditions, which they did. BCO: So what’s next for you and LucyKate Crafts? AA: I’m still not sure I want to do another book. There are a few ideas in my head though. A book is a big commitment and an all-consuming project, so for the time being I’m concentrating on the PDF patterns. There is also a yearning to develop my designs towards exhibition pieces, fulfilling a more sculptural aspect and moving away from the cute. Yowzers! What an inspiring crafter Amy is. Here’s hoping she does end up exhibiting some of her designs – I’d love to see ’em on a larger scale.